Cruze into October with Bob Bell! Fans of the Chevy Cruze rejoice: Cruze into October and upgrade for less at Bob Bell Chevy! Bob Bell has the BEST deals on Chevy Cruze in Baltimore during the month of October. With only a few remaining 2015 models in stock you won’t find a better deal! We have to make room for the 2016 models. Check out all of our Chevy Cruze inventory by clicking on the banner above or search through the Specials below! Be sure to check out the videos below on the interior design and safety features. Contact our Internet Sales Manager Jesse Fletcher for more details or schedule a test drive. Have a question? Just use the Contact Us form below. More mileage. More space. More control. The 2015 Cruze gives you more than you would ever expect in a compact car. It starts with efficiency. 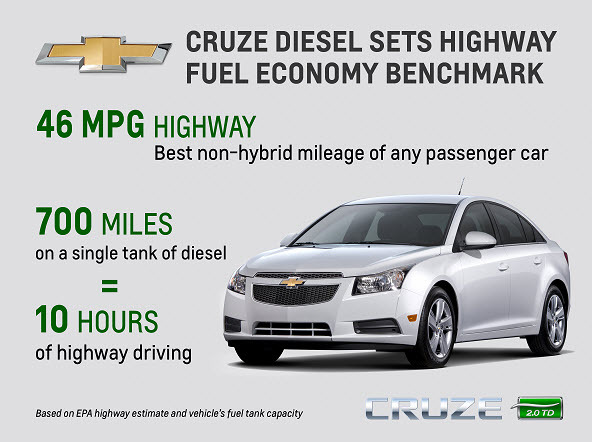 Cruze Clean Turbo Diesel boasts 46 MPG highway. Cruze Eco up to 42 MPG highway and Cruze offers up to 38 MPG highway. No matter which one you choose, you won’t sacrifice performance and responsive handling. Inside Cruze you’ll discover more refinements, ample cargo room, and the latest in-vehicle connectivity features and state-of-the-art safety technology. Isn’t time to expect more from the everyday drive? The Cruze diesel will be GM’s first diesel car sold in the United States since the 1980s. As reported in Autoweek this month, General Motors said the 2014 Chevrolet Cruze Turbo Diesel will deliver an estimated 46 miles per gallon on the highway. This is 4 mpg more than the original target. The estimate is also good enough to top a rival the 2013 Volkswagen Jetta diesel, which achieves 42 mpg on the highway. The Cruze’s 2-liter turbo diesel engine produces 148 horsepower. The Cruze diesel, featuring a six-speed automatic transmission, has an estimated range of 700 highway miles. It emits 90 percent less nitrogen oxide and particulate emissions than earlier diesel models, according to GM. The engine also has an overboost feature capable of increasing torque to an estimated 280 lb-ft for short bursts of faster acceleration when needed, such as entering fast-moving highway traffic. According to data from TrueCar.com, the authoritative voice in new car pricing and industry trend information, the most popular cars purchased around the Fourth of July last year (June 27 – July 10, 2011), were either American brands or assembled in the USA. Visit us at Bob Bell Bel Air Chevrolet for savings worth celebrating alongside Independence Day… We’re offering savings on the 2012 Cruze, Traverse, and Silverado until July 9th. Fuel prices are above $3.80 per gallon nationally… and it’s not going to drop drastically any time soon, or ever. As fuel prices continue to rise, customers are more interested in fuel-efficient compacts and hybrids to find relief from the pump. So if you’re looking for an environmentally responsible car that fits your budget and your lifestyle, visit Bob Bell Chevrolet of Bel Air, we have plenty of options for you.